It used to be that a tax return was selected for an IRS audit based on a DIF Score (Discriminatory Index Function) issued by the IRS. The DIF Score is a mathematical technique used to rate tax returns for potential examination. However, now we are learning that the IRS has developed the machine learning computer program" in their Artificial Intelligence Division. According to Reference.com, "Machine Learning" is a type of artificial intelligence that is concerned with the design and development of algorithms and techniques that allow computers to "learn". Machine learning programs detect patterns in data and adjust program actions accordingly. The IRS inputs the data from past tax returns, which then yields patterns or predictions, and that determines the new" learned" audit parameters. "This type of audit first became known to Fresh Start Tax when two clients sought professional assistance for tax audits," states Sullivan. "The Revenue Officer assigned to one of the cases knew immediately that these clients were being audited due to the Machine Learned Audit." As it turns out, the data from the Machine Learned Audit was incorrect and these taxpayers should not have been selected for audits. Because the process is so new, the audits being selected are unpredictable and the results are incorrect in most cases. As the Machine Learned audits are selected by a computer, this also takes away the ability for taxpayers to attach supporting documentation to tax returns. According to Jesus Mena, a former Internal Revenue Artificial Intelligence specialist and author, The IRS has used machine learning programs for predicting noncompliance, nonpayment, identifying tax shelters and underreporting. The number of audits performed annually is determined by the IRS Annual Budget and Agent availability, region by region. According to the 2013 Proposed Budge, the IRS has increased appropriations again to increase resources for the Enforcement Divisions. This encompasses investigations, examinations, and collections. If you are an in need of assistance for an upcoming IRS audit or would like to settle your case, via an Offer in Compromise, please contact the Tax Resolution Specialists at Fresh Start Tax LLC. Fresh Start Tax is a professional tax resolution firm. On staff are Board Certified Tax Attorneys, CPAs, and Former IRS Agents, Managers and Instructors. We have over 206 years of professional tax experience and over 60 years of direct IRS experience. 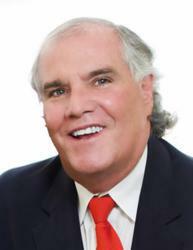 To learn more about Fresh Start Tax, LLC, please visit http://freshstarttax.com or call us at (866)700-1040. California Auto Insurance HQ announced this morning that they will be donating all proceeds from November 1, 2012 to November 30, 2012 to the charities that support this great cause. November is National Diabetes Awareness month. There are nearly 26 million children and adults in the United States with diabetes. At this time there is no cure in sight. Ive watched my wife deal with this disease for almost ten years. says Nicholas LeRoy, owner of californiaautoinsurancehq.com. Insulin injections, blood glucose tablets, high blood sugars, low blood sugars its not a game. This disease has a daily impact on peoples lives. To help increase awareness for diabetes research Californiaautoinsurancehq.com has offered to make a charitable donation from their November earnings directly to the JDRF & ADA. Both of these organizations are active participants in diabetes research as well as outstanding resources for public education. The website has created a diabetes awareness page where information can be found on exactly how people can support this cause while also saving money on auto insurance. According to Nicholas LeRoy, Everyone who drives a car needs auto insurance coverage. People would be amazed how much money they can save by simply doing some comparison shopping online. The benefit to doing it now is that you can be an important part of an awareness campaign for a disease often overlooked. Nicholas LeRoy originally built his website out of frustration for the way auto insurance quotes were received. You had to call each and every insurance agency and provide them your driving information. They would in turn plug it into their computer and spit out a policy price. Because you dealt with only one company at a time they didnt have to compete directly with each other for your business. By requesting quotes online big name insurance companies are now forced to offer their best rates right awaythus providing the customer with the best deals possible. Not interested in receiving a personalized auto insurance quote but still want to invest in a cure? Californiaautoinsurancehq.com has set up a Cure Diabetes badge that allows you to easily add the image to your own website. The goal of this badge is to help increase visibility for National Diabetes Awareness month, and is a great way to show your support. For individuals looking to make a charitable donation directly to JDRF or ADA more details can be found here. 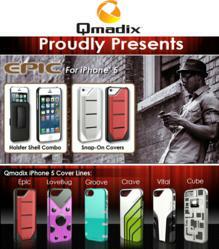 Qmadix, known as a leader in tech gadgets and accessories, proudly announces the anticipated release of their Epic covers. This new line of protective and stylish covers serves to defend the iPhone 5 from accidental drops and scratches. Epic covers feature a rubberized ultra sleek durable frame that is complemented by contrasting color accents offering a truly sophisticated appearance. We were inspired to create a cover with a minimal design for anybody that desires the convenience of a snap-on cover. We wanted to show the details of the design and differences in surface textures and finishes to make the Epic covers said Jimmy Kuan, from the Qmadix Development and Design team. The single-piece cover sports three horizontal stripes that span across the center of the cover to add a stylish look and extra grip for the user. It is easy to appreciate all the finer details envisioned and implemented into the design of the Epic covers. Available in matte and glossy finishes on the sides that are complimented by brushed aluminum-like texture feel on the back makes this cover a true work of art that is still very protective. For iPhone owners that do not like the feeling of a phone in their pocket, Qmadix also offers a Holster Shell Combo version of the Epic cover that comes equipped with a belt clip. The cover easily slides into the Holster that features a ratcheting swivel belt clip that doubles as a kick-stand. From the colors, design, and textures every aspect of the Epic covers are deliberately designed to protect your device in style. Epic Covers are available now for $ 34.99 at http://www.qmadixonline.com. Color combinations include: Red/Black, White/Black, and Black/Black. Qmadix has a proven track record in developing and implementing effective accessory programs across all major channels, including Mobile Network Operators, Dealer Agents, Distributors and National Retailers. Our focus is to help our partners become more profitable by providing innovative products and backing them with value-added programs such as education, training, vendor managed inventory (VMI), private label branding and fulfillment services to enhance the support to our customers. We have built our business from the ground up and have continued to grow and evolve in the accessory industry. Qmadixs team is dedicated leaders with over 20 years of success in the accessory industry. Their long-standing commitment to providing quality products and innovative solutions has always been the cornerstone of the Qmadix philosophy. GameChanger Products LLC, http://www.gamechanger.net, a growth and innovation consulting firm for major brands, announced today that it has been named to the San Francisco Business Times Fast 100 list of the fastest-growing private companies in the Bay Area. GameChanger helps Fortune 500 brands like Valvoline, General Mills and Nestle instill an entrepreneurial mindset which sharpens their innovation process, thereby reducing costs and increasing their success rate. Its services include Retail Lab where companies can test sell new products to live customers in real stores; GC Combinator, where teams of entrepreneurs work with corporate managers to build innovative new products; and MVP Product Sourcing, which helps companies build inexpensive, sellable prototype products. Being listed in the Fast 100 by the San Francisco Business Times is another terrific validation of the success weve been experiencing at GameChanger, said founder and CEO Larry Popelka. The San Francisco Bay Area is home to a huge number of fast-growing innovative companies, like Facebook, Twitter, Google and Apple, so it is truly an honor to be recognized as part of this group. Members of GameChangers top-flight marketing team includes former executives and consultants from P&G, Apple Computer, Unilever, eBay, Starbucks, Clif Bar, Expedia, Bare Escentuals, eLoan and Annies Homegrown. GameChanger Products, LLC is an innovative marketing company based in Alameda, CA, that focuses on breakthrough new product concepts. Inc. Magazine ranked GameChanger at No. 518 on the 2012 Inc. 500/5000, an exclusive ranking of the nation's fastest-growing private companies. For more information, please see http://www.GameChanger.net. A recent poll article on GraphicDesign.com revealed that a vast majority of the design community has run into poorly written graphic design job descriptions, perhaps leading to inferior candidates being placed in coveted positions and the hiring process becoming complicated and costly. The poll article can be read HERE. Seventy-five percent of GraphicDesign.com readers, an overwhelming sum, answered "All the Time" to the question "How often have you been frustrated by poorly written or overly broad job descriptions?" Eileen Laitinen may only be 24 years old, but this SFSU graduate is making a name for herself in the Bay Area's promising field of design start ups. Her new company, an independent design work space called Comfy Chair, is pleased to announce their official launch at the end of August. The business is designed to provide graphic designers and upcoming digital artists with much-needed design space, providing freelancers and indie developers with affordable and professional options that would typically be out of their price range. While pursuing her own design career after college, Laitinen realized that many freelancers like herself were burdened by their lack of a professional design workspace. Working from home may be the dream of some professionals, but for graphic designers and artists who utilize powerful computers and design software on a daily basis, working without a workspace often spells a lack of productivity. Comfy Chair is furnished with high-powered computers and input technology for the varied needs of game designers, programmers, digital artists, and independent animators; and provides a workspace tailored to success at all times. The workspace at Comfy Chair includes a customizable selection of fully licensed animation, artistic, and design software from leading developers. In addition to private spaces, the business also offers classroom environments, group conferences and meetings, and practically any other permutation of available space to fit the specific needs of their clients. The company even provides a massage chair, small 3D printer, and contact information for legal and business resources to enhance their customers' experience. The space itself is designed to balance relaxation with invigoration, alternating its color schemes and design to keep things interesting and inspiring for the worker's eyes. Comfy Chair Offers Shared Workspace for Graphic Artists and Digital Designers. While work and projects can be completed at home, in digital environments, or even at a coffee shop, many find having a professional work space imperative to productivity as well as cultivating contacts and clients. What makes this work space unique is who it targets; they give animators, game designers, and digital artists some of the needed tools to successfully complete projects and market themselves. The target customers are start-up companies that specialize in digital arts, animation, and game design. These are people who are serious about their projects and businesses and have already endeavored to secure funds and establish their plans of action. Take a moment to calculate how much you spend on coffee or how much time you lose on home distractions. Let us give you a space to work that is tailored to productivity. For more information visit their website at http://comfychairtoworkin-sf.com. Building on its leadership position in the digital broadcast market, NXP Semiconductors N.V. (NASDAQ: NXPI) today announced that it has developed the industrys first ultra-wideband solution for Doherty architectures. This patent-pending solution will uniquely enable manufacturers of digital transmitters to enjoy the high-efficiency gains that Doherty power amplifiers confer with greatly expanded bandwidth. The pressure to deliver richer content is driving manufacturers of broadcast equipment to demand higher efficiency transmitters that utilize the maximum power available and are as cost-effective as possible. Doherty topologies offer 45-50% efficiency, representing at least 15% improvement over traditional UHF technologies that only reach 30% efficiency, and are proving to be increasingly popular. However, the principal challenge up until now has been how best to apply the narrow-band high efficiency benefits of Doherty amplifiers to a market that requires a solution that covers some 400 MHz of bandwidth. NXP has a very strong leadership position in Doherty architectures the company has an extensive Doherty IP portfolio and employs the worlds leading expert in this area. 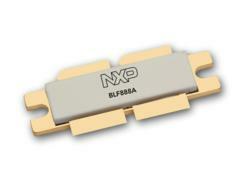 NXP helps its customers by providing flexible Doherty reference designs to fit specific customer timing and performance criteria (such as efficiency and bandwidth) in the UHF band. We believe that the new ultra wideband variant of Doherty will have a major impact on the digital broadcast market, said Mark Murphy, director of marketing, RF power and base stations, NXP Semiconductors. Today's high-performance TV transmitters constitute serious investments, and so our customers need to implement higher efficiency solutions without incurring extra costs, and without delaying time to market. For this challenge to be met, the market needs suppliers who not only provide leading-edge products in areas such as Doherty power amplifiers, but can also offer expert application support to match. This is exactly where NXP fits in. Investment decisions cant be made by inexperienced, less-than-knowledgeable traders, said a recent article from Absolute Wealth, unless they have accepted the fact that risks exist and money can be lost. However, if they use an established plan and have the ability to see trends and patterns unbeknownst to other traders, the article said the likelihood of success greatly increases. Absolute Wealth, in cooperation with British financial wiz Guy Cohen, has produced an investment program called Trade the Banks. The article said its giving folks a plan that works market wonders and highlights the most trustworthy actions to take at any particular time. 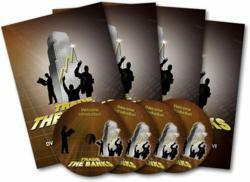 Trade the Banks uses hi-tech market indicators that shine a light on actions that are normally left in the dark. By showing users what the biggest banks and financial institutions are doing, the article said Trade the Banks allows investors to ride on the shoulders of the giants with the largest influence. The crown jewel of the Trade the Banks indicator software is the OVI scanner, which stands for Options Volatility Indicator. Despite its name, the article said it has nothing to do with trading options, which can get rather confusing. Instead, it focuses on the moves made by those large financial institutions, making Trade the Banks a nearly foolproof system, according to the article. Members of Trade the Banks have the right to use those indicators at their disposal, as often as they like. The article said the indicators make the system extremely easy to understand, and break online trading down to something akin to shopping on Amazon or eBay. Once people understand the Trade the Banks procedure, the online piece said theyll never again look at online investing the same. Trade the Banks is better than other trading plans, and the article said it doesnt take much to fully understand it. The members-only website includes full training guides, easy access to the indicators, and a simplified process for making a trade. It helps beginners get a hang of the process, and also guides more seasoned traders to even more profitable success. Absolute Wealth is an expert team of real investors and advisors devoted to identifying winning strategies for exceptional returns. Members subscribe to the companys Independent Wealth Alliance for professional investment analysis and recommendations on the latest market trends and progressions. For more information and subscription instructions, visit AbsoluteWealth.com. When traders try to establish a plan, the article said they dont always consult the wisest of sources. Absolute Wealth and Guy Cohen have the credibility of years of experience, and will set investors on the path to success. Dont make uninformed investment decisions without a program that will make things as clear as possible, advised the article. Launched in 2010, Black Top Shopping is owned and operated by D&DS Subsidairys, a Nevada corporation. The company provides print and video media coverage on the global fashion industry, along with discount and rebate offers, expanded operations to include retail jewelry sales in 2011. The primary factor in making its decision was the global distributed server network, MrMail.com's VMware Zimbra Premium Services platform provides which is essential to delivery high speed response to its audience around the world. MrMail/com cloud hosting allows the company to consolidate its media publication and retail operations conserving the company's financial resources even as its network continues to expand. "MrMail.com Cloud Hosting is the ideal choice because it helps us in three target sectors essential for our growth," said David E. Smith, President of D&DS Subsidairys. "First, it reduces our hosting overhead - giving us the ability to use services on demand, reducing the time and resources that would be required in traditional hosting; second, it provides the speed and efficient delivery we need with the global server distribution allowing each geographical area to have immediate access to our services; and third, MrMail Cloud Hosting significantly improves our collaboration capabilities making it easier for us to respond to customers anywhere in the world from a local network." Working with Suneva Webcasting, Inc., MrMail.com provided Black Top Shopping.com with a solution consisting of a VMware Cloud Server, LinuxCentos 6.3 operating system, Nginx webserver with an Apache backend and Parallels Plesk 11 administration panel. The solution helps the company to deploy services and interactive features to cater to the fast developments in the retail fashion industry, bringing down the deployment times of specialized services from days to hours. "With the new e-commerce division, the ability to integrate their network seamlessly was the primary concern; both their contributors and website visitors desire a secure and fluid experience when they access the different sections of Black Top Shopping.com. The growth in their operations faced a significant challenge in managing the diverse demands from each of these divisions using traditional hosting. MrMail's VMware Zimbra Premium Services Cloud Hosting provides them with an integrated system and the flexibility needed while reducing their costs," said Oliver Bross, CEO of MrMail.com. TheVMware Cloud Hosting Systems offered by MrMail.com provides clients with an viable alternative to traditional hosting models, where multiple applications require significant financial commitment to set up and maintain. D&DS Subsidairys, Inc., founded 2003 has its headquarters in Las Vegas, Nevada, with a branch office in Brooklyn, New York. The company launched Black Top Shopping.com in 2010 which publishes news and information related to the retail fashion industry. In choosing New Literacies, New Learning as the theme for The Educational Forum, a Kappa Delta Pi publication, Dr. Alan Amtzis, Academic Editor, invited Dr. Patricia Paugh to join him to learn the ways in which developments of technology and interactive digital media are augmenting, extending, and amending the traditional functioning of teaching, learning, and education. Dr. Amtzis is Director of the Master of Education Program in Educational Leadership: Instruction for The College of New Jersey. Dr. Paugh is an Associate Professor in the Curriculum and Instruction Department at the University of MassachusettsBoston. The Educational Forum, vol 76, no. 4 (October-December 2012) explores how learning, and teaching, are changing as a result of the proliferation and availability of digital and computer-based technology. In 1436 Guttenbergs moveable type printing press ushered in the first tidal wave of what might be called New Literacy. Because learning has always been tied to the spoken or written word, memory and recall have been the proof of learning. However, memorization is being replaced by access and retrievability, which are changing the nature of application, depth, and utility. Kappa Delta Pi is pleased to offer perspectives from senior scholars, essays from K-16 classroom teachers, and current research on New Literacies, New Learning through a themed issue of The Educational Forum, says Dr. Amtzis. Senior scholars Dr. Dana Wilber, Dr. Julie Coiro, Dr. James Paul Gee, Dr. Elena Forzani, and Dr. Donald J. Leu offered overviews of the emergence and future of new literacies. Classroom teachers from elementary school through college education courses submitted essays explaining the uses and effects of new literacies in their classrooms. Titles range from Digital Storytelling: Using Technology to Spark Creativity to Cell Phones Transform a Science Methods Course and from Finding a Voice: Freedom through Digital Literacies to Trust and Mobile Media Use in Schools. Research reports cover adolescent interactions with text across discourses, twitteracy as a new literacy practice, peer collaborations in online inquiry, Hip Hop as a new literacy, and concerns about the paths of new literacies. In her Closing Editorial Statement, Dr. Paugh states that new literacies, while emerging in a digital age, are more than technology; they are practices that lead to new social structures and new ways of being in the world. 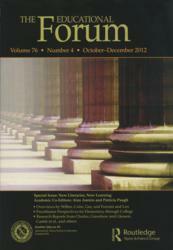 The Educational Forum is a doubly masked peer-reviewed academic journal published quarterly to provide thought-provoking, challenging essays, research reports, and featured works designed to stimulate dialogue in education on a worldwide scale. To learn more about The Educational Forum, visit Kappa Delta Pi Publications. To purchase this issue or any of the articles from this issue, visit Taylor & Francis Online. For more information about Kappa Delta Pi, visit http://www.KDP.org or call KDP Headquarters at 800-284-3167. Kappa Delta Pi, International Honor Society in Education, is a 501 (c) (3) organization established in 1911 to recognize and promote excellence in education, provide a reasoned voice for significant issues, and link learning communities of educators. Through its programs, services, and strategic partnerships, KDP supports the professional growth and teaching practices of educators throughout all phases and levels of their careers. The organization currently has more than 600 chapters and an active membership of 43,000 worldwide.